Tinnitus Maskers: The Whats, Whys, Hows Answered HERE! The usage of tinnitus maskers has found great popularity amongst many people suffering for tinnitus – the existence of ringing sounds in the ear in the absence of external sounds. Tinnitus maskers are devices to help cope with the annoying sounds of tinnitus. These devices have evolved over time with many tried and tested methods to bring relief to tinnitus suffers. Although these devices might not work for every person suffering from tinnitus, they do provide some much needed respite in cases where the tinnitus sounds are unbearable and cause intense suffering and stress. Since the condition of tinnitus is caused by many different factors and has different intensity of manifestation in people, one needs to carefully examine if tinnitus maskers are indeed the right thing to go for. There are many things to consider when prospecting the usage of tinnitus maskers. How do Tinnitus Maskers work? Tinnitus maskers are devices that artificially create nature identical or synthetic low frequency noises with the intension of diverting the focus of the mind away from the sounds in the ear or the head. In short, tinnitus maskers are used to suppress (and thus mask) tinnitus sounds. Tinnitus maskers are manufactured in many shapes and designs to suite different cases and conveniences. For example, some of these are available as wearable ear plugs (for those who might require constant masking) and others are in the form of a bed side device that can emanate noise through the night (for those who only have problem at night during sleep times). Some are even available in the form of sound pillows. The range grows every year and new tinnitus maskers are added to the existing ones. Most of the tinnitus maskers use white noise that creates soothing sounds similar to rainfall or ocean surf. Some of the newer devices use a combination of natural and synthetic noises that are specially created to suit the intension of masking. Tinnitus maskers however do not cure the condition. 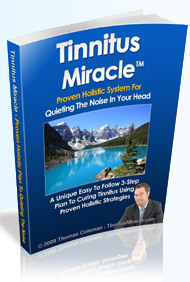 For a solution to tinnitus, one needs to holistically treat tinnitus after looking for the root cause of the symptoms.